ELMHURST – Embittered and resentful after years of watching strangers rummage through his family’s mountainous piles of discarded antique paintings, chandeliers and appliances placed curbside ahead of Elmhurst’s Annual Spring Clean-Up, local resident Jim Bradbury is determined this year to stop garbage pickers from making off with his trash. 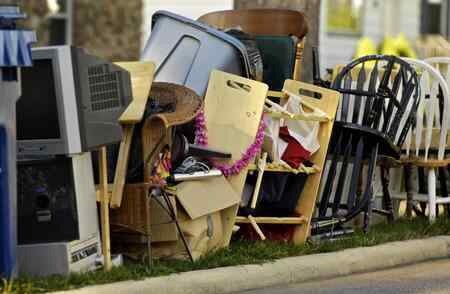 By scheduling family members for around-the-clock guard duty – supplemented by looks of disapproval from his living room window – the Sherman Avenue resident is confident that nothing will be removed from the curb leading up to his neighborhood’s April 23rd collection date. “I would just feel better knowing that our former valuables wind up crushed, melted and molded into a soda bottle or something, rather than end up in the hands of somebody else,” said Bradbury, surveying his guest house for more items to dispose of. While he is “95% sure” that two jet skis picked from his curb last year was the work of his next-door neighbor, Bradbury insists that most garbage looting is done by “outsiders”. “You can tell that they’re not from around here,” said Bradbury, noting car models and unfamiliarity as indicators to support his statement. At press time, Bradbury was still contemplating whether to ask the garbage man or his landscaper to clean up the mess often left behind from foragers.